This modern top entry Petmate cat litter box allows your cat to comfortably acceΒ the litter from above, through a large opening in the lid of the box. 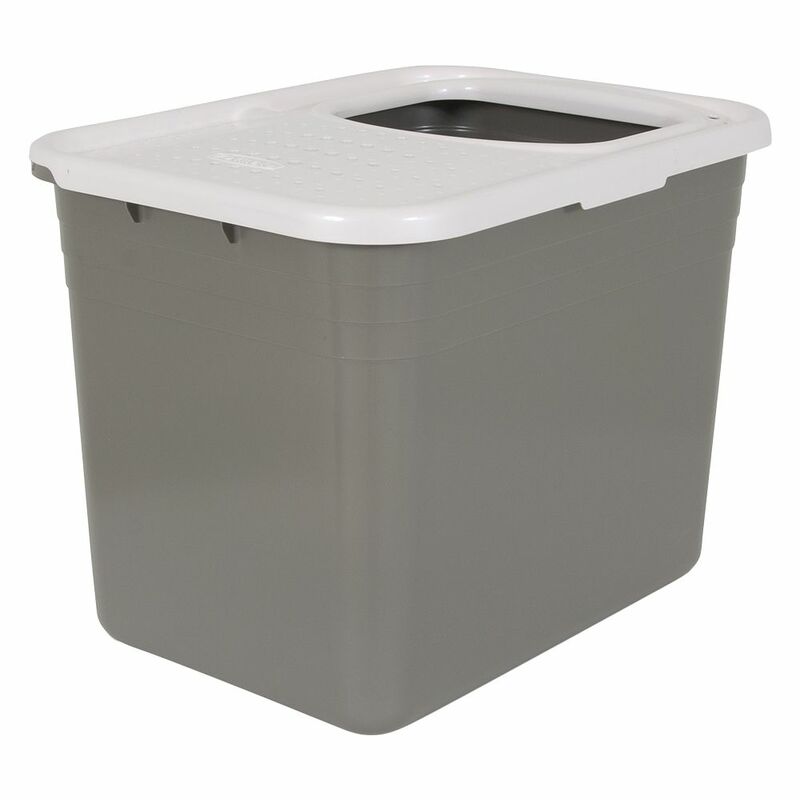 The most innovative feature of this top entry litter box is its arched and perforated lid, which the cat walks acroΒ when entering or leaving the litter box. The special surface of the lid with its anti-slip texture ensures that any litter still clinging to the cat's paws when it exits the box stays on the lid. The small holes in the lid help the litter to fall back down into the litter tray inside when you lift the lid, keeping the litter box's surroundings clean and hygienic. The high walls of the litter box ensure that litter, liquids and dirt always stay inside the box, as well as preventing dogs from digging in the litter. The base of the litter box has an integrated hand hold to help you in moving and emptying the box. The hinged flap cover is completely removable, making cleaning simple and quick. Petmate Top Entry Cat Litter Box at a glance: Modern Petmate litter box with top entry Innovative hinged flap lid with large entry opening: Perfect for larger cats Arched lid with perforations: The cat will walk acroΒ the lid when leaving the litter box and the special surface ensures that any litter still clinging to the cat's paws when it exits the box stays on the lid and falls back into the tray Modern Design with high sides: Ideal for cats that stand to pee. Keeps litter out of the reach of dogs Integrated hand-hold in the base: For easy emptying Includes a handy hook for the litter scoop (scoop not included) Anti-Slip surface on the lid Lots of room inside Hinged lid can be completely removed for cleaning Easy cleaning Eco-friendly manufacturing from 95% recycled plastic Made in USA Colours: Litter box: anthracite Lid: light grey Dimensions: Total dimensions (L x W x H): 51. 5 x 38 x 38.5 cm Inner dimensions (L x W x H): 50.8 x 38 x 38 cm Entrance: approx. 24 x 22 cm Entry height: 38.5 cm Tip: Place the litter box against a wall, so that your cat is obliged to walk acroΒ the lid before jumping down.